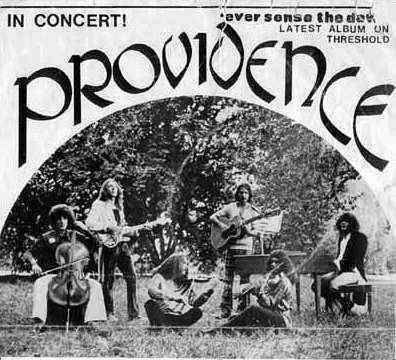 Providence, a six-piece band from the Portland area that was in effect from about 1971 to 1974. They released a single and an album entitled "Ever Sense the Dawn" in 1972 on Threshold Records (THS-9). This was a really sweet group, somewhat reminiscent of the Moody Blues, but with their own individual style, very classically oriented. I am trying to track down the rest of the band as I write this. I understand Bart Bishop (younger brother of record producer and agent Randy Bishop) is working in retail somewhere in L.A. 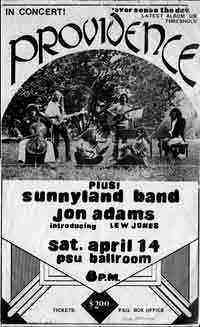 Some members of this band actually ended up touring as the string section for the Moody Blues, and the Blue Jays, Justin Hayward and John Lodges' other band. Andy Guzie was in Portland last I checked. Bob Barriatua is a doctor in Portland. The Tompkins have a website, gallopaway.com.